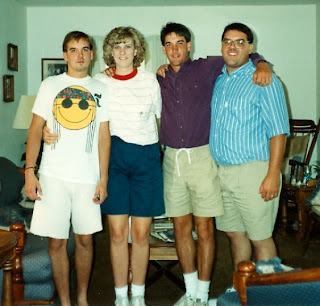 June 1989......This photo is almost 20 years old. Quit laughing right now! Especially if you are in my gene pool. I mean it. Stop laughing. I look GOOD...really good. Well, I mean 20 years ago I looked good. How about my hair? It was 1989....and I lived the 80's. Those other three look...well, hairy. None of them have anywhere near that much hair on their heads these days...on their backs, maybe. Just sayin'. And the last time I checked, um, my legs....they looked, well, thicker. And maybe a little jiggly. OK OK a lot jiggly. Man, I miss those legs from the 80's! One question....Who let me wear those shorts and why are they pulled up so high?? ?